DYLANINTHECITY: YSL Major Re-Branding and Name Change! YSL Major Re-Branding and Name Change! Iconic Fashion House, Yves Saint Laurent, has just undergone an enormous change under the reigns of it's new Creative Director, Hedi Slimane! Just months after acquiring total creative control over enigmatic brand, Slimane has reportedly opted to make history and officially change the name Yves Saint Laurent to Saint Laurent Paris! The name change came as a shock to the fashion world, as it not only affects the brand's identity as a Fashion House, but also the historical significance of the name itself. Founded in 1962 by Pierre Bergé and legendary designer Yves Saint Laurent (after his emancipation from the House of Dior) Yves Saint Laurent, as a brand, quickly became one of the most luxurious and sought after Design Houses on the planet. Forever changing the aesthetic of the chic woman, Yves Saint Laurent helped usher fashion into a new age; taking Haute Couture to the streets, and creating the first Prét-à-Porter line in the world. Yves Saint Laurent was a name the evoked more than the designer himself; it evoked freedom, power, and absolute finesse; and represents one of the three major shifts in fashion history spear-headed by brilliant designers the likes of Coco Chanel and Alexander McQueen. The name YSL, as well as the logo, have been ingrained in fashion history as synonymous with ultimate luxury and style ever since. Anyone who knows anything about me knows that I absolutely worship Yves Saint Laurent! He was one of the most incredible, fearless designers that has ever graced the world's runways with his work. Almost everything we see in modern women's wear today, in some form, can be traced back to some of his original ideas, visions, and silhouettes (as well as Chanel, I should say in fairness). He created ultimate classic, and it's because of him the Fashion House itself became the epitome of style that it did; holding quite prominently the position, up until the moment Yves himself decided to close the Couture House officially in 2002, just 6 years before his passing. This re-branding effort has come in an attempt to return YSL to it's former prominence as one of the leading luxury Houses in the world. It is, according to Slimane, a new, modern take on the brand's public identity. As someone who adores everything YSL has represented, this is almost sacrilegious for me to hear! The logo itself is fashion history, and the very idea of not seeing the name of that incredible designer grace those designs as they should is almost cringe-worthy! What would Yves say?! I don't know if I can love it, but I don't know if I can knock it either! This may very well be the next, prominent age of YSL. What do you think? P.S. I should mention that this also means that new Collections from Saint Laurent Paris will NOT include the original formatting of the iconic YSL name! Yes, that's right! 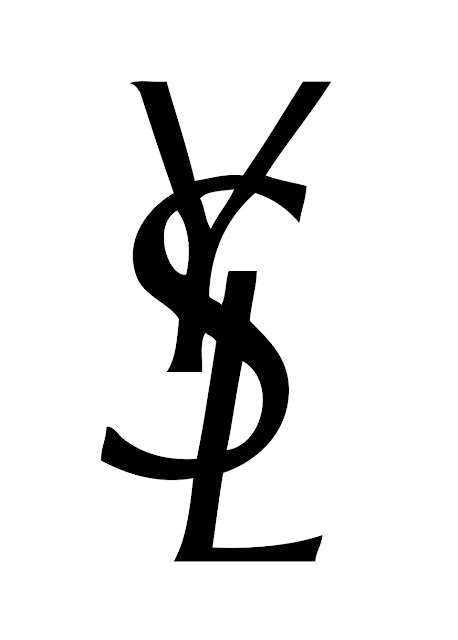 If you can get your hands on a YSL logo print, design, or piece that includes his original name you SIMPLY MUST. It's officially fashion history from this point on people, get yourself a piece of it before it's gone forever! I know I will!